A good marriage doesn't just happen. You have to work at it, just like you do anything else. For example, you may be called to ministry, but it doesn't just happen and success is not automatic. You have something to do with it. The same is true with a marriage! 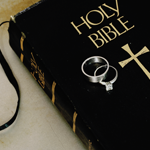 God's ideal of marriage is revealed in Ephesians chapter 5. What you need to do is pick up wherever you are and build your marriage on God's ideal. Let's look at this passage. In talking about marriage, we often start with this passage, in which Paul tells wives to submit themselves to their own husbands. But if we go back a few verses, Paul gives instructions to the whole Church at Ephesus. In verse 21, he tells them to submit themselves to one another. Then in verse 22 he brings up the marriage relationship. By taking a scripture out of its setting, you can make it say anything you want it to say. Many times people quote verse 22 out of context. They say, "Wives, submit yourselves unto your own husbands, as unto the Lord." They leave the impression that the man is the dictator of the home and the woman is supposed to do whatever the man says. Well, if that's the case, we in the Church are also supposed to be dictators over one another, because verse 21 tells the whole church at Ephesus, "Submit yourselves to one another." That would be chaotic. Church to be little dictators. He meant that it is easy to submit to the rule of love. And he meant the same thing when he said in the very next verse, "Wives, submit yourselves unto your own husbands." Let me give you an example. My wife and I were having lunch one time with a certain man and his wife. I noticed that the wife didn't say anything. She was just like a little kid who had been continually intimidated. She was so bowed down. We knew something was wrong with her. As my wife and I visited with them, I noticed that the husband did all the talking. My wife picked up on the fact that his wife wasn't saying anything. So she worked the conversation around, and finally this man's wife spoke up and said, "Brother Hagin, do you think that a wife has any say-so at all? I mean, can she speak in her own home?" I said, "Certainly!" I noticed the husband looked "daggers" through me! I saw where the problem was right away. He wanted to dominate and control her. He wanted her to do exactly what he told her to do. She couldn't even speak unless he allowed her to. This man took a few scriptures out of context. He twisted them to make them say that the husband is to dominate the wife. But we've already seen that's not what the Scriptures are saying. Actually, if you go on and read a verse or two down, it says, "Husbands, love your wives, even as Christ also loved the church" (Eph. 5:25). It definitely wasn't the law of love that this man was demonstrating! You see, the husband should love the wife just as Christ loves the Church. The husband should nourish and cherish his wife as Christ cherishes His own Body. This kind of love far exceeds human love. It's a love in which he puts her first and loves her better than he does himself. And she also loves him with God's divine love. When God created woman to be man's companion and helpmeet, He took part of man and, out of that, He formed the woman. The woman became flesh of his flesh and bone of his bone (Gen. 2:23). Now notice in the Book of Ephesians that Paul made reference to what God did in Genesis—how God made woman out of man: "So ought men to love their wives as their own bodies. He that loveth his wife loveth himself" (Eph. 5:28). The Lord also said, "It is not good that the man should be alone; I will make him an help meet for him" (Gen. 2:18). Actually, the Hebrew word for helpmeet means "an answering unto." I think that's the most unique expression in this wonderful description. Woman was made to answer to the heart need, the spiritual need, the mental need, and the physical need of man. And when man and woman are married, they are to be a distinct unit, utterly separated from all other humans. God wants your marriage to be successful. And by coming in line with the Word, you will experience good results. You will see your home become like Heaven on earth!